How refreshing to have your child's next birthday party be more meaningful and less wasteful! A fresh twist on the conventional birthday party is empowering today's youngsters to help preserve our planet and give back to important charities. I thought you may want to cover. Kids from coast to coast are setting a new trend! Forget the glut of excess plastic toys and packaging, today's children are using their birthdays to make a difference in the world around them through ECHOage.com (www.echoage.com). 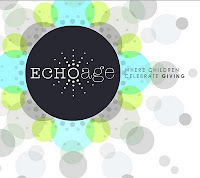 ECHOage is a web-based service that plans eco-friendly, charitable birthday parties for kids. It gives kids a unique platform (their birthday party) to inspire change and contribute to much-needed causes. Plus, it makes birthday party planning and clean-up easier on parents! Here's how it works: Instead of bringing wrapped and packaged presents, guests simply rsvp and make secure online contributions that are pooled together. Half goes to purchase ONE memorable gift for the child and half is donated to ONE meaningful cause of the child's choice. ECHOage arranges everything, so no need for guests to drive, shop, wrap or even pick up the phone to make a donation.